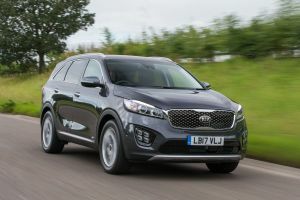 The Kia Sorento SUV 4-wheel drive is a big car and if you are using one of the Gatwick Airport multi-storey car parks, be very careful, writes Malcolm Ginsberg. It is just too easy to hit the kerb when approaching a ramp and scraping the lovely 18in alloy wheels. However, once you have mastered the turning circle, the problem goes. The Sorento is large and spacious with plenty of room for seven, but not if they all have luggage. The rear carrying area is limited and Kia obviously had the choice of making the car even longer, or just limiting the rear space to 142 litres. It is OK for one standard case. But how often does one go seven-up for a holiday? In keeping with the standards that Kia is setting with its other models, the interior feels upmarket and all the controls fall to hand nicely. No gimmicks on the Sorento. Everything is where you expect to find it. Getting to Gatwick with every seat used and a weekend’s luggage for all squashed in was easy. The Sorento quietly eats up the miles and even fully loaded had enough torque when needed for any uphill sections and overtaking. Empty, it will go from 0-60mph in just under 10sec. Noticeable was the jump in fuel consumption, down from a respectable 43mpg to something just over 36mpg, still very good with a full load. The test Sorento, a KX-3, came with the only engine currently available, a 2.2-litre 197bhp CRDi diesel, coupled to a very smooth 8-speed box auto box (manual available). At low revs, like all similar units, it does not pull well, and that is something you have to watch for. This was a mid-range model, very comprehensively equipped including sat nav, automatic folding wing mirrors and a reversing camera. There is no shortage of space inside the Sorento, and taller passengers sitting in the back had plenty of headroom and a USB point to plug in an electronic gadget. However, one drawback is that only the kerb-side seat folds to give access to the third row. The KX-3 offers a panoramic sunroof, LED dynamic bending headlights, an 8-way power-adjustable driver’s seat, engine start/stop button and smart entry system, and a very useful powered tailgate including a courtesy light. A 10-speaker premium sound system is standard, as is a 7in TFT colour instrument display, a wireless phone charger, Lane Keep Assist, automatic headlight beam adjustment and a Driver Attention Warning, designed to issue alerts when it is time to take a break. Other than parking when on a day’s outing means leaving the car in a field, do many people actually make use of the 4-wheel drive system? When conditions get really bad with snow, the police tend to warn people off the road. But it is also a phychological thing. Many feel just that little bit safer with an all-wheel-drive car. The Sorento features a Dynamax intelligent electronically controlled system from Magna Powertrain. It monitors driving conditions continuously and anticipates when power through all four wheels will be needed. Normally it delivers 100% of engine torque to the front wheels, but this can be redistributed up to a maximum of 60:40 front-to-rear to enhance cornering stability or if road conditions deteriorate. For off-road driving, owners can manually select lock mode, which gives a 50:50 torque split at speeds of up to 25mph. This is called Advanced Traction Cornering Control (ATCC). Compared with all-wheel-drive systems which control wheelspin by braking, a spinning wheel or reducing engine torque, ATCC automatically and instantaneously transfers torque to those wheels that still have grip, even before the Electronic Stability Control (ESC) system intervenes. This is linked with Hill-start Assist Control (HAC), which prevents roll-back when setting off uphill. It is no Land Rover, but a simple test in a damp and grassed car park gave no trouble at all. One just simply drove out. All versions have Trailer Stability Assist to make towing safer. It works through the ESC system, and continuously monitors vehicle stability, gently applying some front braking force to the relevant side of the vehicle if it detects a potential loss of control. The Sorento comes into its own as a 5-seater, giving 660 litres of space behind the second row. This slides back and forth and has a 60:40 split. Fold this middle row of seats down via two levers in the side of the boot and you can free up a massive 1,732 litres of space. Drive Mode Select is also fitted to versions with automatic transmission. This allows the driver to select five steering modes, from a more comfort-oriented setting to one which is firmer and sportier, according to preference. It also modifies the automatic transmission shift pattern accordingly. Kia engineers have worked hard to ensure the new model delivers a luxury-car ride and an engaging and precise on-road handling. To this end, the Sorento has all-independent suspension and rack-mounted motor driven power steering. The electric-motor module which controls the steering is mounted directly to the steering rack, bringing the twin benefits of sharper responses and greater precision. Together with the self-levelling suspension, it is in fact nearly a driver’s car, and not just a large wagon for carrying a family around. Two up, it is really good fun. Let there be no doubt. The Kia Sorento is a big car and should be respected for that. The floor level is higher than a normal sedan but it is still easy to get into and looking down on lesser souls can be fun. With five or seven up, it is practical and for two it is plainly extravagant. It does what it does and does that well. List price as tested £38,695.